New York  Citigroup Inc. today reported net income for the third quarter 2017 of $4.1 billion, or $1.42 per diluted share, on revenues of $18.2 billion. This compared to net income of $3.8 billion, or $1.24 per diluted share, on revenues of $17.8 billion for the third quarter 2016. Revenues increased 2% from the prior year period, driven by growth in Institutional Clients Group (ICG) and Global Consumer Banking (GCB), partially offset by lower revenues in Corporate / Other. Net income of $4.1 billion increased 8% from last year including a $580 million pre-tax ($355 million after-tax) gain on the sale of a fixed income analytics business, which contributed $0.13 to earnings per share. Excluding the gain, net income declined 2%, reflecting higher cost of credit, however earnings per share increased 4% to $1.29 driven by a 7% reduction in average diluted shares outstanding7. In the discussion throughout the remainder of this press release, percentage comparisons are calculated for the third quarter 2017 versus the third quarter 2016, unless otherwise specified. Citigroup revenues of $18.2 billion in the third quarter 2017 increased 2%, driven by the gain on sale as well as 3% aggregate growth in ICG and GCB, partially offset by a 55% decrease in Corporate / Other primarily due to the continued wind-down of legacy assets. Citigroup's net income increased to $4.1 billion in the third quarter 2017, as the higher revenues and lower expenses more than offset higher cost of credit. Citigroup's effective tax rate was 31.1% in the current quarter compared to 30.8% in the third quarter 2016. Citigroup's operating expenses decreased 2% to $10.2 billion in the third quarter 2017, as higher volume-related expenses and ongoing investments were more than offset by efficiency savings and the wind-down of legacy assets. Citigroup's cost of credit in the third quarter 2017 was $2.0 billion, a 15% increase, driven by an increase in net credit losses of $252 million, primarily in North America GCB, as well as a higher loan loss reserve build, which included approximately $100 million of hurricane and earthquake-related loan loss reserve builds across North America GCB and Latin America GCB, as well as the legacy portfolio in Corporate / Other. Citigroup's allowance for loan losses was $12.4 billion at quarter end, or 1.91% of total loans, compared to $12.4 billion, or 1.97% of total loans, at the end of the prior year period. Total non-accrual assets declined 19% from the prior year period to $5.0 billion. Consumer non-accrual loans declined 22% to $2.8 billion and corporate non-accrual loans decreased 15% to $2.1 billion. Citigroup's end of period loans were $653 billion as of quarter end, up 2% from the prior year period. Excluding the impact of foreign exchange translation8, Citigroup's end of period loans also grew 2%, as 5% growth in ICG and 3% growth in GCB was partially offset by the continued wind down of legacy assets in Corporate / Other. Citigroup's end of period deposits were $964 billion as of quarter end, up 3%. In constant dollars, Citigroup deposits were up 2%, as a 3% increase in ICG and a 1% increase in GCB was slightly offset by a decline in Corporate / Other. Citigroup's book value per share was $78.81 and tangible book value per share was $68.55, each at quarter end, both representing a 6% increase. At quarter end, Citigroup's Common Equity Tier 1 Capital ratio was 13.0%, up from 12.6% in the prior year period, driven primarily by earnings partially offset by the return of capital to common shareholders. Citigroup's Supplementary Leverage Ratio for the third quarter 2017 was 7.1%, down from 7.4% in the prior year period, driven by an increase in Total Leverage Exposure as well as a decrease in Tier 1 Capital. During the third quarter 2017, Citigroup repurchased approximately 81 million common shares and returned a total of approximately $6.4 billion to common shareholders in the form of common share repurchases and dividends. GCB revenues of $8.4 billion increased 3%. In constant dollars, revenues increased 2%, driven by growth across regions. GCB net income decreased 6% to $1.2 billion, as the higher revenues were more than offset by higher cost of credit, while expenses were unchanged. Operating expenses were $4.4 billion, down 1% in constant dollars, as higher volume-related expenses and investments were more than offset by efficiency savings. North America GCB revenues of $5.2 billion increased 1%, as higher revenues in retail banking and Citi retail services were partially offset by lower revenues in Citi-branded cards. Retail banking revenues of $1.4 billion increased 1%. Excluding mortgage, retail banking revenues increased 12%, driven by continued growth in loans and assets under management, as well as a benefit from higher interest rates. Citi retail services revenues of $1.7 billion increased 2%, reflecting continued loan growth. Citi-branded cards revenues of $2.2 billion decreased 1%, as the benefit of growth in full-rate revolving balances in the core portfolios was outpaced by the continued run-off of non-core portfolios as well as the higher cost to fund growth in transactor and promotional balances, given higher interest rates. North America GCB net income was $655 million, down 16%, driven by higher cost of credit partially offset by the higher revenues and lower operating expenses. Operating expenses decreased 5% to $2.5 billion, as higher volume-related expenses and investments were more than offset by efficiency savings. North America GCB cost of credit increased 27% to $1.7 billion. Net credit losses of $1.2 billion increased 34%, driven by the Costco portfolio acquisition, episodic charge-offs in the commercial portfolio, which were offset by related loan loss reserve releases, and overall portfolio growth and seasoning. The net loan loss reserve build in the third quarter 2017 was $460 million, compared to a build of $408 million in the prior year period. The $460 million net build was comprised of a modest reserve release related to the commercial banking business and an approximate build of $500 million related to the cards business. The net loan loss reserve build in cards was driven by forward net credit loss expectations in both Citi retail services and Citi-branded cards, as well as volume growth and portfolio seasoning and a reserve build for the estimated impact of the hurricanes. International GCB revenues increased 8% to $3.2 billion. In constant dollars, revenues increased 5%. On this basis, revenues in Latin America GCB of $1.4 billion increased 4%, driven by growth in loans and deposit volumes. Revenues in Asia GCB of $1.9 billion increased 5%, driven by improvement in wealth management and cards revenues, partially offset by lower retail lending revenues. International GCB net income increased 11% to $517 million. In constant dollars, net income increased 7%, as the higher revenues were partially offset by higher expenses and higher credit costs. Operating expenses increased 6% on a reported basis and 4% in constant dollars, versus the prior year period, primarily driven by higher investments and volume-related expenses, partially offset by efficiency savings. Credit costs increased 9% on a reported basis and increased 4% in constant dollars. In constant dollars, the net loan loss reserve build was $21 million, compared to $26 million in the prior year period, net credit losses increased by 6% and the net credit loss rate was 1.63% of average loans, increasing from 1.57% in the prior year period. ICG revenues of $9.2 billion increased 9%, driven by growth across Banking, Equity Markets and Securities Services, as well as the $580 million pre-tax gain on the sale of a fixed income analytics business. Banking revenues of $4.6 billion increased 16% (including gain / (loss) on loan hedges)9. Excluding gain / (loss) on loan hedges in Corporate Lending, Banking revenues increased 11%. Treasury and Trade Solutions (TTS) revenues of $2.1 billion increased 8%, reflecting higher volumes and improved deposit spreads. Investment Banking revenues of $1.2 billion were up 14% versus the prior year period, reflecting continued wallet share gains across products, with particular strength in equity underwriting. Advisory revenues decreased 1% to $237 million, equity underwriting revenues increased 99% to $290 million and debt underwriting revenues increased 1% to $704 million. Private Bank revenues increased 15% to $785 million, driven by growth in clients, loans, investment activity and deposits, as well as improved spreads. Corporate Lending revenues of $502 million increased 14% (excluding gain / (loss) on loan hedges), reflecting lower hedging costs and improved loan sale activity. Markets and Securities Services revenues of $4.6 billion increased 3%, as a decline in Markets revenues was offset by higher revenues in Securities Services as well as the gain on sale. Fixed Income Markets revenues of $2.9 billion in the third quarter 2017 decreased 16%, primarily reflecting lower G10 rates and currencies revenues, given low volatility in the current quarter and the comparison to higher Brexit-related activity a year ago, as well as lower activity in spread products. Equity Markets revenues of $757 million increased 16%, reflecting client-led growth across cash equities, derivatives and prime finance. Securities Services revenues of $599 million increased 12%, driven by growth in client volumes across the custody business along with higher interest revenue. ICG net income of $3.0 billion increased 15%, driven by the higher revenues and a higher benefit from cost of credit, partially offset by higher operating expenses. ICG operating expenses increased 5% to $4.9 billion, as investments and volume-related expenses were partially offset by efficiency savings. ICG cost of credit included net credit losses of $44 million ($45 million in the prior year period) and a net loan loss reserve release of $208 million (net loan loss reserve release of $135 million in the prior year period). ICG average loans grew 5% to $321 billion. In constant dollars, average loans increased 4%. ICG end of period deposits increased 3% to $640 billion. In constant dollars, end of period deposits also grew 3%. Corporate / Other revenues of $509 million decreased 55% from the prior year period, reflecting the wind-down of legacy assets, divestitures and the impact of hedging activities. As of the end of the third quarter 2017, Corporate / Other assets were $100 billion, 4% below the prior year period, primarily reflecting the continued wind-down of legacy assets. Corporate / Other net loss of $87 million, compared to a net loss of $48 million in the prior year period, reflected the lower revenues, partially offset by lower operating expenses and lower cost of credit. Corporate / Other operating expenses declined 36% to $822 million, reflecting the wind-down of legacy assets and lower legal expenses. Corporate / Other cost of credit was a benefit of $50 million compared to a cost of $18 million in the prior year period. Net credit losses declined 78% to $29 million, reflecting the impact of ongoing divestitures. The net loan loss release was $79 million, mostly related to the legacy mortgage portfolio, as compared to a release of $122 million in the prior year period. Citigroup will host a conference call today at 10:00 a.m. (ET). A live webcast of the presentation, as well as financial results and presentation materials, will be available at http://www.citigroup.com/citi/investor. Dial-in numbers for the conference call are as follows: (866) 516-9582 in the U.S. and Canada; (973) 409-9210 outside of the U.S. and Canada. The conference code for both numbers is 12255430. Additional financial, statistical, and business-related information, as well as business and segment trends, is included in a Quarterly Financial Data Supplement. Both this earnings release and Citigroup's Third Quarter 2017 Quarterly Financial Data Supplement are available on Citigroup's website at www.citigroup.com. Certain statements in this release are "forward-looking statements" within the meaning of the rules and regulations of the U.S. Securities and Exchange Commission (SEC). These statements are based on management's current expectations and are subject to uncertainty and changes in circumstances. These statements are not guarantees of future results or occurrences. Actual results and capital and other financial condition may differ materially from those included in these statements due to a variety of factors, including the precautionary statements included in this release and those contained in Citigroup's filings with the SEC, including without limitation the "Risk Factors" section of Citigroup's 2016 Annual Report on Form 10-K. Any forward-looking statements made by or on behalf of Citigroup speak only as to the date they are made, and Citigroup does not undertake to update forward-looking statements to reflect the impact of circumstances or events that arise after the date the forward-looking statements were made. 2 Preliminary. 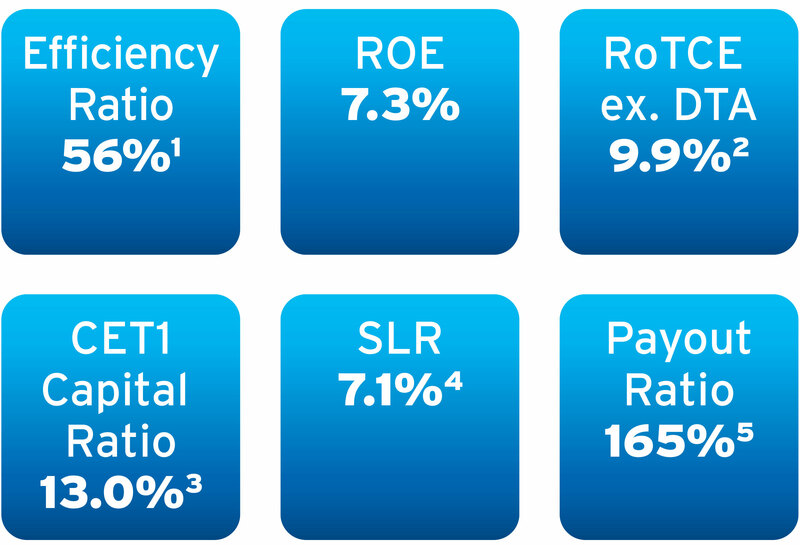 Citigroup's return on average tangible common equity (RoTCE) and RoTCE excluding deferred tax assets (DTAs) are non-GAAP financial measures. RoTCE represents annualized net income available to common shareholders as a percentage of average tangible common equity (TCE). The amount that is excluded from average TCE represents the average net DTAs excluded for purposes of calculating Citigroup's Common Equity Tier 1 (CET1) Capital under full implementation of the U.S Basel III rules. For the components of the calculation, see Appendix A. 3 Preliminary. Citigroup's CET1 Capital ratio, which reflects full implementation of the U.S. Basel III rules, is a non-GAAP financial measure. For the composition of Citigroup's CET1 Capital and ratio, see Appendix C.
4 Preliminary. Citigroup's Supplementary Leverage Ratio (SLR), which reflects full implementation of the U.S. Basel III rules, is a non-GAAP financial measure. For the composition of Citigroup's SLR, see Appendix D.
5 Citigroup's payout ratio is the sum of common dividends and common share repurchases divided by net income available to common shareholders. For the components of the calculation, see Appendix A. 6 Preliminary. Citigroup's tangible book value per share is a non-GAAP financial measure. For a reconciliation of this measure to reported results, see Appendix E.
7 Results of operations excluding the impact of the sale of a fixed income analytics business are non-GAAP financial measures. 8 Results of operations excluding the impact of foreign exchange translation (constant dollar basis) are non-GAAP financial measures. For a reconciliation of these measures to reported results, see Appendix B. 9 Hedges on accrual loans reflect the mark-to-market on credit derivatives used to hedge the corporate accrual loan portfolio. The fixed premium cost of these hedges is included in (netted against) the core lending revenues. Results of operations excluding the impact of gain / (loss) on loan hedges are non-GAAP financial measures.